In the UK and several other countries, a ‘shadow cabinet’ is a group of opposition politicians who ‘shadow’ cabinet members, offering criticism and alternative policies, while simultaneously (presumably) learning the job. The notion of a shadow cabinet is appealing for several reasons. First, elevating certain members to a position of responsibility must surely be one of the best ways to reduce the cacophony politics typically suffers from, since the opposition has nominated a single person whose job it is to analyse and criticise the government’s performance. Second, it means that the criticisms that government and opposition necessarily fling at each other are, to some extent, informed. This, one imagines, serves both to cut out unnecessary blather and refocus political discourse on the issues. Further, it encourages responsibility since both the government and the opposition can reasonably be held culpable for bad leadership. One other significant advantage that cannot be understated is the role a shadow cabinet might play in developing new leaders, which has traditionally been a problem in developing countries like Pakistan, dominated as they are by oligarchs. Take Pakistani politics in the 1990s as an example: with the PPP and the PML repeatedly exchanging position, political horse-trading — always par for the course — resulted in some truly dubious characters taking up powerful positions. With no avenue to enhance their own understanding of the issues and of the basic principles of policy-making, it’s hardly surprising that they skirted the difficult issues and that their only legacy is a progression of increasingly muddled and short-sighted decisions. Given that it is questionable whether their interests were ever aligned with those of the nation, another strong argument in favour of a shadow cabinet is incentivising the development of political savvy and experience by offering access and information to ambitious politicians. The flip side, of course, is the formation of a one-sided political mafia where the government’s cabinet and the opposition’s shadow cabinet collude to even more resolutely refuses to address issues and make hard decisions. Given the obvious failures of the last 60 years, it appears this is worth risking, if only as an interim step to overcome the establishment’s soporific inertia. This entry was posted in Democracy, Development, Government on February 1, 2009 by Admin. Senator Gravel, one of the Democratic presidential candidates, has been making some noise online recently. It’s pretty funny — I watched Robin Williams’ Man of the Year two days ago, and then yesterday, the video below was featured on Reddit. As you can see, Gravel does the closest impersonation of Williams’ character possible without losing credibility. One of the things Gravel’s proposing is to implement FairTax, a system that does away with traditional income tax and instead applies additional duties to goods and services. It’s not quite revolutionary in that other forms of tax, such as highway tolls and the congestion charge here in London, are already applied on a per-use basis, but it has some pretty cool effects. The first thing to notice is that, under the scheme, the additional tax is collected from producers, not retailers or consumers. This means the tax base shrinks immediately, which is good because it makes tax evasion harder and the process more transparent. In addition, the cost of collecting revenues falls dramatically. The second thing is that a flat tax applied to goods and services (assuming it’s flat — we’ll get to that in a minute) makes it almost impossible for special-interest groups and lobbyists to try to have the tax regime biased in favour of the rich or the organised. This isn’t a serious problem in Pakistan, but it’s nice to have. Thirdly, the scheme ties revenue generation to consumer spending, rather than earnings, which probably has significant implications for inflation. At the very least, it encourages savings, which is a good thing, particularly in a credit-hungry country like the US. It’s a little unclear to me whether a flat tax on all goods and services would be a good thing. The argument that it’s fairer doesn’t really hold water, since luxury goods that are consumed only by the rich would raise the tax rate for everyone. Consequently, a tiered tax rate might make more sense. The scheme includes the notion of pre-bates to relieve unfair burden from the ultra-poor, which sounds like a good idea. I have read, though, that the ratio of spending between the rich and the poor is approximately the same as the ratio of earning between the rich and the poor, which would mean that the gulf between rich and poor wouldn’t be bridged in any way by this scheme. That actually sounds fair enough to me, since the point of taxation isn’t to artificially redistribute wealth (which would invariably lead to inflation). My interest in this, of course, relates to taxation in Pakistan. The two big problems we face are ridiculously high levels of tax evasion and a culture of kickbacks and corruption. The former, it is often said, is difficult to tackle simply because much of Pakistan’s economic activity is unrecorded. This doesn’t imply a lot of black market activity, but rather just that smaller retailers don’t maintain records that can be easily examined. The government has resorted to increasingly lax policies to fix the situation, including a recent one which promises that tax returns, no matter how absurd, will not be disputed by the government. There’s no guarantee this will work, of course: some people claim the reason economic activity isn’t recorded is illiteracy. It’s obvious how a system like FairTax would be useful here: the government would no longer have to worry about tracking down and auditing every small retailer (and all his employees), since it would only deal with the producers supplying the retailers with goods. The problem of corruption would also be addressed, since the scheme is far more transparent and enforceable than filing returns. In effect, you pay tax every time you buy an item, whether it be a sandwich or a Mercedes. There is simply no reason left to slip envelopes to tax officials. There are other benefits of FairTax that I have not discussed, for example that the overall tax burden over an average lifetime is much reduced under the scheme. Clearly, it is a promising idea and given the failure of our current tax regime, it might be one worth considering. This entry was posted in Taxation on April 29, 2007 by Admin. I’ve just finished reading a very interesting book right now called ‘The Tipping Point’. It’s one of those paperbacks that management consultants take with them on flights, packed with anecdotes and research that not only backs up the book’s thesis, but zigs and zags through other topics as well. The central idea is interesting: that the transportation of a product, idea or even social movement from its niche into the mainstream hinges on just a very few things, and that tweaks to these can result in massive changes. One of these hinges is context. The author recalls the crime epidemic New York City suffered in the 80s and the early 90s, and reveals that violent crime on the subway fell drastically when the city introduced a strict policy of removing graffiti as soon as it was spotted. Removing graffiti doesn’t have an obvious connection to violent crime on the face of it, and the suggestion is that changing the environment to communicate a refusal to permit vandalism translated into an implicit message that more serious crime would also not be tolerated — a message that was taken seriously enough that crime fell by 75 percent! The important points here are that systemic problems don’t necessarily need revolutionary remedies, and that these problems often rest on top of other issues that are more easily resolved. Naturally, one wonders how these principles might be applied closer to home, as perhaps with the crippling problem of corruption. In case anyone needs a reminder, Pakistan ranks 144th in the world, behind even Iraq. Obviously, there are major legal and structural changes that need to happen within the bureaucracy to encourage transparency and accountability, but might smaller, easier changes have drastic effect? The one that comes most readily to mind is to bring salaries back in line with market rates, or at least the cost of living. Happily, this needn’t be an exercise in pure rhetoric: there are facts and policies to examine here. The Central Board of Revenue, for example, has introduced a policy (at the prodding of the World Bank) to double the salaries of officers in crucial positions. The results so far? Mixed. Apparently, the very selection process for the scheme has become political, leading to more nepotism and back-scratching. In addition, I’ve heard first-hand about at least one person whose selection has actually impacted his performance negatively. Given the fact that this policy is both well-intentioned and sensible, it seems the fault lies in how it is implemented. Enter the other two hinges mentioned in the book: implementation, and the implementor. The CBR’s scheme, for example, does not address the problem of accountability as it does not link the increased salary to performance, but rather to position. And the problem of nepotism exists only as long as the administrators of the scheme permit unfair selection to slide. Corruption is one of several problems facing Pakistan that appear insurmountable because they have become so ingrained in the way things are done. ‘The Tipping Point’ is interesting in providing ways to decompose problems into more manageable constituents, and lending hope that tackling them is not a hopeless task. This entry was posted in Development, Taxation on December 23, 2006 by Admin. Atif Ali describes the fund-raising his organisation, CVBoosters, is doing on behalf of The Citizen’s Foundation. This really is a great idea, since it’s sustainable and rewarding for both volunteers and donors, which is certainly key to success! They say that necessity is the mother of all invention; it’s strange just how true that statement is. Back in July after completing our finals at the LSE, four of us who had just landed jobs at leading investment banks, decided to make full use of the opportunity afforded to us. Having heard about the tremendous work going on in Pakistan by The Citizens Foundation, we thought it would be rewarding if we too could build a school in Pakistan. With this in mind we said our farewells and left the LSE. A few months later, having entered the world of investment banking, I met a friend for iftar. She had just returned from Pakistan to start her job and while out there had witnessed first-hand the impact a TCF school was making to its surrounding community. As she went on to describe how the lives of the students were being radically changed I began running through fundraising ideas that I had been mulling over for the last few weeks. Of all the ideas, a CV checking service seemed to be the one project that we could genuinely add value to and simultaneously raise some money for the charity. Since graduate applications for investment banking jobs were now well under way we had to move fast. Within a week we had set up the framework for our idea and CVBoosters opened for business. Our idea is simple: we check CVs and cover letters and offer budding investment bankers a chance to take part in a half-day interview workshop. These workshops are run by investment bankers, giving the students a very realistic simulation of what to expect at final round interviews at investment banks. For this, we ask for a small donation with all proceeds going to The Friends of the Citizens Foundation, the UK registered charity supporting The Citizens Foundation. Over a month has now passed and we have expanded our services and are continually refining the way we do business. We have run two immensely successful interview workshops at the LSE in conjunction with the LSE Chinese Development Society and have attracted over a dozen bankers ranging from Analyst to Vice-President Level, all keen to volunteer to help run our workshops. We are currently in the process of setting up a website for CVBoosters and will be running further workshops at the LSE, UCL and Imperial in January. I must admit, I see incredible potential for this project and am currently looking at a number of areas which we can expand into. To be honest, when we started I never dreamt that we would even make one hundred pounds yet as I write this piece we are just a few pounds shy of one thousand and have helped three students secure jobs at Goldman Sachs, Deutsche Bank and Barclays. Our motto is for us to win someone else has to win as well and if we stay true to this and work earnestly, I believe we’ll make a real difference to the lives of students both here and in Pakistan. If you would like to take part in one of our projects or would like to make a donation to The Friends of the Citizens Foundation please visit our donation page www.justgiving.com/cvboosters. For more information about the charity please visit The Citizens Foundation website. This entry was posted in Education, Social Work on December 11, 2006 by Admin. Whew, it’s been a while since I posted anything here. But fear not: I’ve got at least one interesting post lined up about a couple of enterprising young graduates who’ve found a great way to serve not only the community of Pakistani students at the LSE, but also contribute to The Citizen’s Foundation. Tune in December 4 to check it out! This entry was posted in Social Work, Uncategorized on November 23, 2006 by Admin. 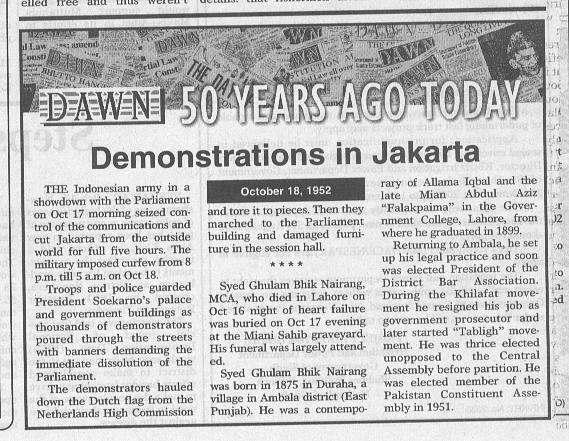 The Daily Dawn, in its ’50 Years Ago Today’ feature, printed an obituary of Ghulam Bhik Nairang that mentions his prominence in Muslim political circles before partition, and his friendship with Allama Iqbal. For those with an interest, the excellent Jinnah of Pakistan website, an amazing compendium of information about the Quaid-e-Azam, tracks events in the Quaid’s life, and mentions G.B. Nairang as a frequent companion. The website is well worth a visit, offering pictures, audio and video alongside text. This entry was posted in Ghulam Bhik Nairang on October 5, 2006 by Admin. The Daily Dawn carried a piece by Syed Zafar Ali Shah a few years ago that spoke of G.B. Nairang’s great friendship with Allama Iqbal and included a short biography. I am reproducing it below. Sometimes a writer provides a vital clue to his innermost thought in an off- hand manner without caring whether this bit of ‘clue’ would lead to some serious study yielding some interesting conclusions. We come across a couplet in Allama Iqbal’s poetry in which he shares with us two names – his contemporaries – both of them good poets who were, according to the Allama, his Hum Safer, co-sharers of that great mission of co-travelling towards the muse of poetry. The above couplet throws some light on the kind of mission or poetry Iqbal believed in. This is a clue which distances Iqbal from the predominant trends – I would not call it a tradition – of Urdu poetry. He is more of a disciple of Sir Syed and Hali when it comes to discussion of the functions of poetry. Nairang was an important leader of Muslim India and an important poet of his day. He remained a member of the Central Assembly of India from 1936 to 1942 and was the deputy leader of the Muslim League parliamentary party in the Assembly from 1938 to 1942. This fact alone is enough to evaluate his importance. From the days of the Khilafat Movement to the heyday of the Muslim League he was a leader whom Allama Iqbal looked upon as someone who could be a source of strength. He put up strong resistance to the Shuddhi and Sangathan Movement which created leaders such as Golwalkar, Monje and Savarkar who succeeded in alienating Muslims from the mainstream politics of India. It is a pity that some scholars don’t pay attention to the root causes of communalism in India and forget that manufacturing of rhetoric against one section of the population cannot help us to appreciate the real causes which led to the point of no return in Indian politics in the 1930s. The key to the parting of ways lies to those vastly powerful machines of rhetoric which are, by the day, strengthening themselves. Here one would like to mention the Gujarat riots – as documented by the Communist Party of India’s Urdu periodical Hayat (August 2002 issue). Nairang’s role against Shuddhi and Sangathan in the early 1940s should be read with a view to finding out convergence between him and all those poets who believed in the maxim that any nationalism using territorial and cultural nationalism has all the germs of fascism because it has the tendency to regard all those who don’t subscribe to it as the ‘others,’ and hence hell. Nairang’s poetry collection appeared in 1907. Its second edition was published in 1917 and the third edition – a bit enlarged with a detailed introduction by Dr Moinuddin Aqeel – appeared some time ago. Born in Daurana, Ambala, in 1876, Nairang did his BA from Government College, Lahore. He was a class-fellow of Allama Iqbal and was also his hostel-mate. His other classmates were Sir Fazal Husain, Mian Abdul Aziz Malik Falak Paima and Bakhshi Teek Chand. Nairang became a lawyer and joined politics. In order to fight Shuddhi and Sangathan – which were very active movements in the Punjab for the reason that the Punjab proved to be a fertile ground for the Arya Samajists – he also formed an Anti-Shuddhi organization. He was also on the editorial staff of the Makhzan. He was also a member of Pakistan’s first Constituent Assembly. Talab nay khai hain woh thokrain rah-i-tamanna mein Kay aakhir mujh say sharmanay lagi hai aarzoo meri. Ae waye na rasai-i-dast-i-daraz-i-shauq Aur aap ka nikal kay woh jana qareeb say. I believe that Nairang’s crusade for communal harmony in the subcontinent should be remembered with a sense of gratitude. He appealed to the majority community to desist from the path of sowing the seeds of discord because it is more likely than not that a day would come when those seeds would become trees casting long and wide shadows. This is what the situation is today in our neighbouring country. After many moons of inactivity and intermittent planning on what to do with the Nairang domain, I’ve decided the way to go right now is to set up a blog. This lets us (me and interested parties; contact me if you are one) thrash out what we want to do with the domain and the Foundation as a whole. Its also a convenient way to add information, particularly links to news and articles that are of importance to Pakistan’s development. Eventually, this blog will be moved to a different path, and a full-fledged website will take its place. This entry was posted in Administrative on September 25, 2006 by Admin.